Thought it couldn’t get worse/crazier than a unknown Randroid college “economist” knocking off the sitting majority leader? Oh, no. No. No. No. No. There’s yet a Marianas Trench for these folks to dig. Not to worry, though. Pressed on the subject, Mr. Esk allowed as he merely accepts such a course of action, rather than actively planning to work to put Oklahoma squarely into the 5th century. Before the Common Era. Also clear: these people hate America. They are ignorant of its history and have no connection to the essential principles on which a pluralistic, free society utterly depends. They must not be allowed near the levers of power. And they are the base of the Republican Party. I leave the rest of the exercise to the reader. 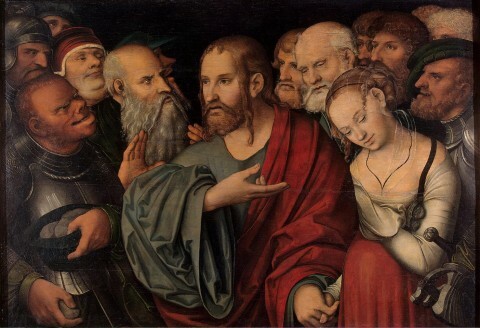 Image: Lucas Cranach the Younger, Christ and the Adultress, after 1532. Explore posts in the same categories: Republican follies, Republican knavery, Why Do They Hate America So? This entry was posted on June 11, 2014 at 4:47 pm and is filed under Republican follies, Republican knavery, Why Do They Hate America So?. You can subscribe via RSS 2.0 feed to this post's comments. Tom, Loved your POV. Just know that insanity … It’s not just for North America. Check out a friend’s Blog at http://www.brazilogue.com for the latest from the Land of Futebo and Favelasl! I agree with your points, but scorn is not going to attract readership from the scorned. So you’re preaching to the choir, and bound to accomplish nothing with this sort of article. Not trying to achieve readership from the “scorned” as you put it. Trying to galvanize action against them. I’m never going to persuade Mr. Esk and his ilk that they’re clueless bigots who need to rethink their position; I can work to marginalize them politically and culturally, which is what this kind of post is aiming to do.